When the flame disappeares, remove from heat, pears are ready. Roll dough to a thickness of about 2 cm and with a diameter slightly larger than the pan diameter. Remove cinnamon stick, leaving anise (do not eat it too, but it is already at serving you take it out) and on top cover pears with dough, a bit 'wrapping' edges. again, very carefully, because the pan and caramel is extremely hot!!! Be careful!!! Grease on top with mixed egg and bake in oven for 20-25 min till golden color. (180℃ with convector). Remove hot pie from oven, slightly «move» knife by walls of pan, as " separating dough from the pan and leave it for 5-7 min in form. 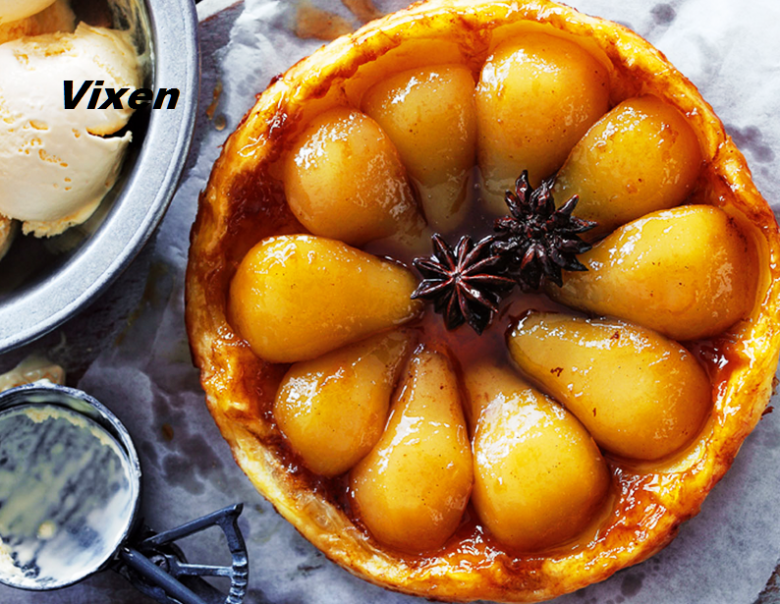 Top of recipe "Caramelized pear pie with cinnamon and anise ("Tarte tatin")"